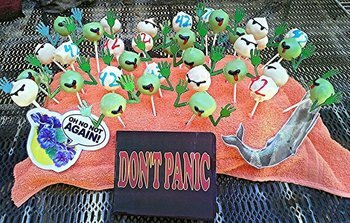 Library Thing is sponsoring their 4th annual edible books contest. If you’d like to show off your baking prowess, get a chance at winning some books, and have a lot of fun, see Library Thing’s blog. The deadline is April 19. The picture is of last year’s winning entry, inspired by the Hitchhikers’ Guide to the Galaxy.